This first video above gives you a taste of what Ueli Steck can do. He may be the fastest mountain and rock climber in the world. He is a real inspiration. You won’t believe what you see. One person I showed it to admitted that her palms were sweating. She also wondered how he gets down. The second video helps you understand how Ueli thinks and how he innovated and rewrote the traditional Swiss Alpine climber manual. Lots of interviews here of Ueli and other climbing authorities. Now here are some of his records and then a great article from swissinfo.ch. You can see more videos and pictures here . Ueli Steck has actually broken the record for the fastest ascent up the north face of the Eiger twice, including his own. The first time he shaved 45 minutes off a record of four hours, 30 minutes, set by Christoph Heinz in 2003. 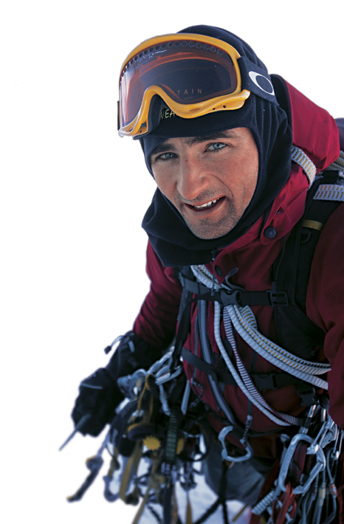 Then in February 2008, Steck pruned 58 minutes off his own time, climbing the north face alone in winter in a staggering two hours, 47 minutes, 33 seconds. The Eiger Nordwand is particularly perilous because rocks and ice chunks rain down the face onto climbers below. The 1,800-metre high wall also acts as a backstop, trapping virulent storms even while better weather lingers over the surrounding area. Most climbers need two days to tackle the Eiger’s treacherous north face, but if you’re Ueli Steck, Switzerland’s fastest alpinist, you can do it in less than three hours. You wouldn’t spend all day on the north face of the Matterhorn, either. Steck bagged that one in one hour, 56 minutes, compared with the ten nerve-wracking hours it takes most people. The north face of the mighty Grandes Jorasses near Chamonix, France? Steck ticked it off in a blistering two hours, 21 minutes. The 33-year-old from the rolling Emmental in canton Bern is one of the world’s best free-soloists, the most perilous of all the climbing styles. He often tackles dangerous routes with no ropes or gear to guard against a fall. A single mistake can mean a horrific death.